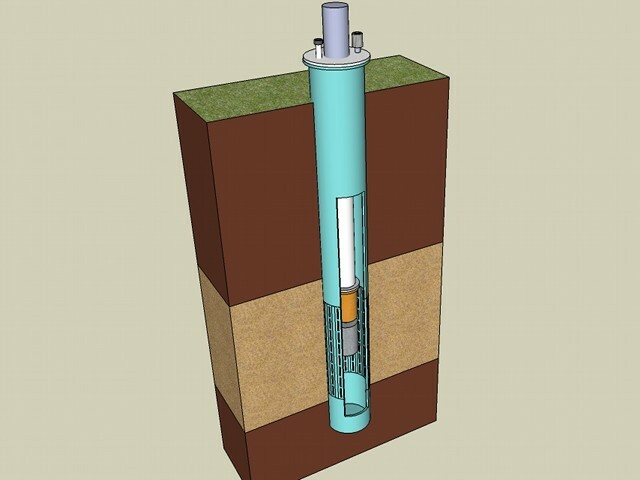 A water well is a vertical pipe with a filter. The filter is positioned at the sand-layer. The sand-layer is filled with water. The submersible pump has two parts. A water tight electrical motor and a centrifugal pump. The pump transports the water through the pump-pipe to the surface. The pump is often equipped with a check valve. At the top-side of the water well you will find an air-filter and a pipe to check the water level inside the water well. Top-side of a water well. Normally you only see a small part of a water well. 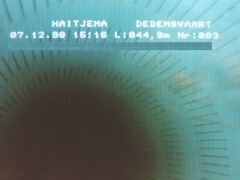 The well-pipe ends about 20 centimetre above ground-level. At the end of well-pipe a flange is mounted. The well-head is positioned on this flange. The smaller tube connects to the the central ground-water pipe that goes to the purification station. 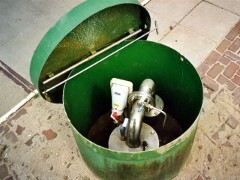 On this tube you will also find a sample tap, to check the water-quality of the water well. You can also see an electrical connection that delivers power to the water tight electric motor in the water well. And there is also a level check pipe and an air-filter. 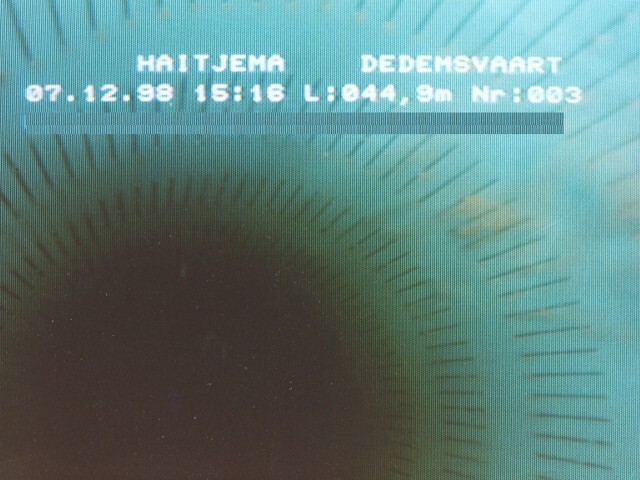 With the level check pipe you can measure the water level inside the water well. If the water level, with the pump switched on, is to low the water well has to be cleaned. Because the water level in the water well varies when the pump is on or off, the air above the water level goes in or out the well pipe through the air filter. The most important part of the water well is the filter. The filter is positioned at the sand-layer. This sand-layer will easily let the water through. These sand-layers can be hundreds of kilometres long. The filter is normally made from a PVC pipe with narrow slots. You can also make filters from copper, stainless steel or wood. The size of the slots is chosen so that it lets the water through but not the sand. On the picture you can see a problem with this water well. Unfortunately fine sand is coming through the slots. This fine sand will cause problems in the sand filters in the purification station. This water well could not be repaired and was later replaced by a new water well. The amount of water that a water well can deliver depends on how easily the water can flow through the sand-layer. The amount can vary between 25 m3/h up to 200 m3/h. Look at an video presentation of a water well.